The United States declared war on Britain in eighteen twelve. It did so because Britain refused to stop seizing American ships that traded with France -- Britain's enemy in Europe. Britain finally suspended its orders against neutral trade, after a change in government. But the British acted too late. The United States had declared war. Today, Larry West and Frank Oliver continue the story of the War of Eighteen Twelve. The United States navy was not ready for war. It had only a few real warships and a small number of gunboats. It could not hope to defeat the British navy, the most powerful in the world. What the United States planned to do was seize Canada, the British territory to the north. Twenty-five hundred British soldiers guarded the border. And American generals believed they could win an easy victory. They were wrong. Detail of a mural by Allyn Cox in the Capitol building. 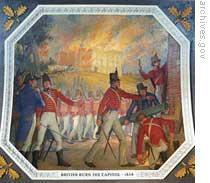 The painting shows the burning of the Capitol in 1814. An American general named William Hull led two thousand men across the Canadian border. British soldiers were prepared, and they forced the Americans back. 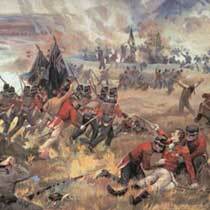 The British fought so well that General Hull surrendered all his men and the city of Detroit. The next American attack was made from Fort Niagara, a military center in New York on the shore of Lake Ontario. A small group of American soldiers crossed the Niagara River and attacked the British. Other Americans -- state soldiers of New York -- refused to cross the border to help against the British. They calmly watched as British soldiers shot down the attacking Americans. The third campaign was made by General Henry Dearborn. He led an army of state soldiers from Plattsburgh, New York, to the Canadian border. He was to cross the border and attack Montreal. But the state soldiers again refused to cross the border. Dearborn could do nothing but march them back to Plattsburgh. British forces at this time were winning victories. They captured an American fort in northern Michigan. And Indians -- fighting for the British -- captured a fort at the place now known as Chicago. Instead of marching through Canada without difficulty, the Americans found themselves trying hard to keep the British out of the state of Ohio. For a while, the weak little American navy was doing better than the army. Just two months after the war started, the United States warship Constitution forced a British ship to surrender. Several months later another American ship, the Wasp, captured the British ship Frolic. Then the frigate the United States defeated one of Britain's most famous fighting ships, the Macedonian. The British ship was captured and brought to the United States. There were other victories at sea. At the end of six months, the United States navy had captured six British ships and lost only one of its own vessels. Private American trade ships had been armed with guns when the war started. They, too, were successful against the British. They captured more than three hundred British trade ships. The American successes forced Britain to bring more of its fighting ships into the war with the United States. By the middle of eighteen thirteen, a year after the war started, British ships controlled the United States coast. Not an American ship could enter or leave any port south of New England. The military situation was improving in the West. William Henry Harrison, governor of the Indiana territory, formed a large force to try to capture Detroit from the British. At the same time, Captain Oliver Perry built five warships on Lake Erie. With these and four he already had, Perry met and completely defeated an English naval force. Perry reported his victory to Harrison: "We have met the enemy, and they are ours." Perry's victory and Harrison's large force caused the British to withdraw from Detroit, and from a British fort at Malden, in Canada. Harrison's men continued to chase the enemy. They caught them and defeated them in the battle of the Thames. Killed in this battle was the great Indian chief Tecumseh who had been fighting for the British. United States forces made new attempts to win control of Lake Ontario and invade Canada across the Niagara River. But none of these succeeded. Late in eighteen thirteen, British soldiers crossed the river and captured Fort Niagara. They also burned the town of Buffalo. By April eighteen fourteen, Napoleon was forced from power in Europe. And the war between France and Britain was over. This permitted Britain to send many of its soldiers in Europe to fight against the United States. Fourteen thousand troops were sent to Canada. A smaller force was put on ships that sailed along the American coast. Another group of British soldiers was sent to Jamaica to prepare for an attack on New Orleans. The British planned to send an army of eleven thousand men down from Canada into New York. But before this, the soldiers aboard ships along the American coast were to attack the Chesapeake Bay area and threaten Washington and Baltimore. About four thousand British soldiers landed on the Chesapeake coast, southeast of Washington. They marched quickly toward the capital. An American general, William Winder, commanded a force two times the size of the British group. Winder was not a good general, and his troops did not defend well. The two sides met at Bladensburg, a town ten kilometers from Washington. The British attacked and at first the American defenders held their ground. But then, British soldiers broke through the American lines, and the Americans began to run away. General Winder ordered his men back to Washington. A group of sailors refused to retreat with their artillery. Commanded by Joshua Barney, the four hundred sailors chose to stand and fight. The struggle did not last long against the four thousand British soldiers. Barney held his position for a half hour before enemy soldiers got behind his men and silenced the guns. Barney was wounded seriously. The British thought so much of his courage that they carried him to a hospital for their own soldiers at Bladensburg. Barney himself said the British officers treated him as a brother. Once the British force had smashed through Barney's navy men, nothing stood between it and Washington. The enemy spent the night about half a kilometer from the Capitol building. The commanders of the British force, General Robert Ross and Admiral Sir George Cockburn, took a group of men to the Capitol and set fire to it. Then the two commanders went to the White House to burn it. 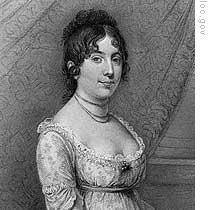 Before setting fire to the president's home, Cockburn took one of President Madison's hats and the seat from one of Dolley Madison's chairs. The admiral found the president's table ready for dinner. As a joke, he took a glass of wine and toasted the health of "President Jemmy." President Madison had fled the White House earlier. He crossed the Potomac River and started toward his home in Virginia. He joined his wife on the road the second day. And they decided to wait with others about twenty-five kilometers from Washington. The president returned to the capital three days after he left it. The British, after burning most public buildings, had withdrawn. The British coastal force next attacked the city of Baltimore. But this time, the defenses were strong, and the attack failed. Baltimore port was guarded by Fort McHenry. British warships sailed close to the fort and tried to destroy it with their guns. But the attack did little real damage to the fort. A young American civilian, Francis Scott Key, was aboard one of the British warships during the twenty-five-hour shelling of Fort McHenry. He and a group of others had gone to the ship with a message from President Madison. The message asked the British to release an American doctor they were holding. All through the night, the young man watched the shells bursting and the rockets exploding over the fort. In the first light of morning, he saw that the American flag still flew. 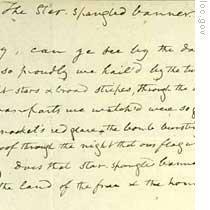 On the back of an old letter from his pocket, Francis Scott Key wrote the words of "The Star-Spangled Banner," the national anthem of the United States. Our program was written by Frank Beardsley. The narrators were Larry West and Frank Oliver. Transcripts, MP3s and podcasts of our programs are online, along with historical images, at www.unsv.com. Join us each week for THE MAKING OF A NATION – an American history series in VOA Special English. The war broke out between Britain and U.S.A in 1812. The United of State was defeated by British force. 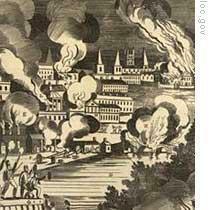 The general commander set fire to the city of Washington and they also destoried many cities. the national anthom was born by real accident. it is moving story. say, a young man had been in the site of the campaign between Britian and the usa. he saw all through the night the shells bursting and the rockets exploding over the fort. but in the first light of morning, he saw that the American flags still flew. by the moving of it , the young man wrote the words " the star-spangled banner". his name is Francis Scott Key.